12 ins x 12 ins white canvas. Offcuts of different types of material including silk, grosgrain, cotton, canvas, polyester and hessian. All the material was either white or ‘brown’ in colour when purchased. This is really good for your scraps or buying from shops which have a remnant bucket. Grungeboard skull and crossbones, hinges and flourish pre-cut dies. Dimension Fourth Upper Case rubber stamps. White vellum with computer words ‘best friends’ printed on it. Velvet, silky, stripy and spotty ribbon. Distress inks in Black Soot, Stormy Sky, Broken China, Antique Linen and Walnut Stain. Cosmic Shimmer Mists in Midnight Blue, Peacock Green, Meadow Lush, Golden Mint, Aqua Lagoon, Ocean Sunlight and Silver. Blue card for matt behind photo. Take each piece of material and spray with different Cosmic Shimmer mists. Use different techniques such as spray one colour then let it dry, spraying another over the top, or spraying a colour then spraying another straight away whilst wet and creating another colour by allowing them to mix. Allow all the material to dry out overnight. Take your distress inks and canvas and apply the ‘direct to paper’ technique. (apply ink straight from the pad to the canvas). Put it in different places, use different colours of blue and green, and leave parts white. Take a brush and water and dilute in places, so it is not too harsh on the canvas. Either leave to dry or use a heat gun taking care not to burn the canvas. Matt your photograph with cardstock and place a brad in each corner. Paint the skull and crossbones and hinges with gold acrylic paint, dry off with a heat gun and edge these with Black Soot distress ink. Put the brads through the hinges. 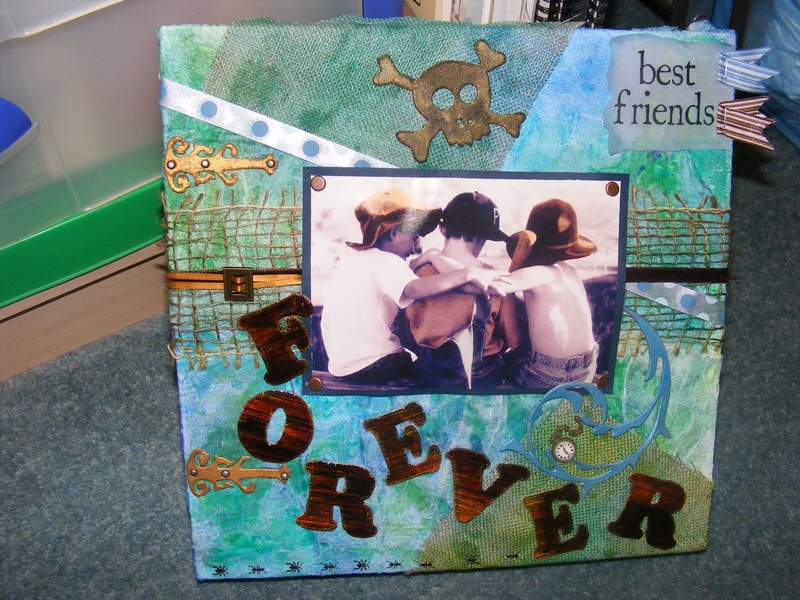 Tear around the vellum printed ‘Best Friends’ and ink the edges with cut and dry foam and blue distress ink. Spray the Grungeboard flourish with blue Cosmic Shimmer Spray and dry with a heat gun. Stamp the alphabet letters ‘FOREVER’ in Versafine onto Grungeboard and use clear embossing powder over the top to raise the outline. Cut these letters out. With cut and dry foam colour in the letters with Antique Linen and Walnut Stain Distress Inks. Using Glossy Accents to cover the letters and leave to dry overnight. Before affixing anything to the material play about with ribbons, embellishments, and the photograph, to place them in the area on the canvas you want them. Either make a sketch of where everything is placed or take a photo, so you can recall where to place everything when sticking it down. I placed the spotty ribbon then the grosgrain, then the silk ribbon with a buckle and velvet ribbon down first, followed by the flourish then the photograph. The skull and crossbones, pocket watch embellishment, and ‘best friends’ came next with the ‘best friends’ vellum being secured with folded ribbon and staples. Next came the hinges, followed by the word ‘Forever.’ Lastly I placed ant rub-ons to the bottom of the canvas. All of it was glued down with Cosmic Shimmer glue apart from the vellum as you would be able to see the glue through the transparency of the medium.